An independent publisher of high quality non-fiction titles. Early American Criminals: An American Newgate Calendar, Chronicling the Lives of the Most Notorious Criminal Offenders from Colonial America and the New Republic, an Amazon.com Bestseller, is now available. Most books about crime in colonial America focus on blasphemers, adulterers, and witches burning at the stake. Not this book. 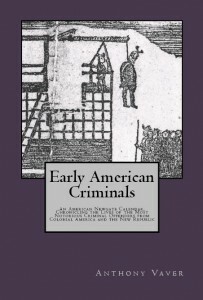 In Early American Criminals, crime historian, Anthony Vaver, examines early America’s most notorious criminals: burglars, murderers, pirates, counterfeiters, and other offenders who would be recognized as criminals even by today’s standards. Vaver uncovers the dark, compelling, and even humorous stories from America’s earliest criminal underworld: a New England burglar who walked through the unlocked door of a goldsmith to rob his store a second time; a man who sat all morning on his roof in fear that someone walking by might harm him, but who ended up committing murder by day’s end; a transported convict who charmed her young lover into selling himself into servitude to raise money for her release from prison. In telling the stories of these and other criminals, Vaver shows how early Americans both thought about and punished criminals differently than we do today. Poor parenting, abusive masters, and the influence of “The Devil” were often cited as motives for criminal behavior. Punishments that included the pillory, whipping, and hanging all took place in public so as to warn others not to follow a criminal path. Nowadays, we look to psychology to explain criminal behavior, and we punish our criminals behind closed doors. But, as Vaver makes clear in his book, even though our treatment of criminals differs from the past, the crimes that early Americans worried about are strikingly familiar to us today. Anthony Vaver is the author of the Amazon bestseller, Bound with an Iron Chain: The Untold Story of How the British Transported 50,000 Convicts to Colonial America and writes and publishes the blog EarlyAmericanCrime.com. He has a Ph.D. from the State University of New York at Stony Brook and an M.L.S. from Rutgers University. Early American Criminals is an Amazon.com Bestseller in the subject category of Colonial American History! This entry was posted in Early American Criminals. Bookmark the permalink.